As a 7 year old learning about how my grandpa gave himself insulin injections everyday, I wanted to know how to give him an injection and check his blood sugar. Surprisingly, he even would let me give the injection. This was my first introduction to medicine that I remember. Fast forward to now and I am in my second year of medical school, learning how to tell patients they have diabetes and how to give themselves injections. These skills and nuances of interacting with patients are developed and polished in small group interactions with standardized patients, peers, and physicians. While developing these skills in small group sessions, we also had clinical experiences with a physician. Once a month during my pre-clinical years, I went to work with a physician. Let’s refer to her as Andrea. Andrea would let me go interview patients while she wrote notes or we would tag team that day and she would see a different patient. She helped me work on my patient interview and diagnostic skills. To her patients, she showed kindness, compassion, and explained what was happening in their care plan very well. One of the patients I interviewed was an approximately 75 years old woman, who I’ll refer to as Belle. She was one of the sweetest patients I had interviewed. She said she was having more trouble breathing and had been using her inhaler more often, along with her nebulizer. She was using 3 pillows to help her breathe while she slept. When I examined her legs, she had some pitting edema, which means there was fluid accumulation in her legs that would leave an imprint if I pushed on it with my finger. Belle had a 40-pack-year history of smoking, but stopped smoking 5 years ago. Furthermore, she had heart failure. I left the room thinking she had a worsening of her heart failure. I spoke with Andrea and she agreed. Andrea went in to follow up with Belle. They worked on a care plan of how to improve the symptoms, set up an echocardiogram, and chest x-ray. Belle thanked us for our time and told me she could tell I am going to be a great doctor and had wonderful bedside manner. This officially made her my favorite patient I had interviewed. Usually with these encounters only occurring once a month, we don’t often see the same patient. To my surprise, Belle was on the schedule the next time I came in to work with Andrea. Andrea had some tough news to tell Belle though. They had done the chest x-ray and it showed some cloudiness in her lung so they treated her for pneumonia. Unfortunately, Belle didn’t have resolution of the area after treatment so they went in for a biopsy. The biopsy showed adenocarcinoma, a cancerous tumor that can occur in several parts of the body. This was shocking news to me. Belle came to the appointment with her daughter. Andrea and I went into the room and the anxiousness was palpable. There were worried expressions on both Belle’s and her daughter’s faces. Andrea went through the steps that led to the biopsy and then what the biopsy showed. Silent tears dipped down Belle’s face and I worked hard to not let mine fall too. Belle told us she thought it might be cancer and she had prayed and thought on it before coming to the appointment today. She wanted to know her options for treating the cancer, but knew she had a good life and was hesitant to have chemotherapy. She followed with, “I quit smoking and it still happened. I wish I had never smoked.” Belle looked at her daughter who boldly stated, “This is why I ain’t quitting. I have been smoking for 25 years and I probably will get it too. I might as well do what I like.” I could see Belle’s shoulders drop and a slight look of disappointment by what her daughter had said. Andrea and Belle set up an appointment with an oncologist. Belle thanked us again for helping her with her health and she wished us the best. We wished her the best and Belle hugged both of us and we parted ways. When I started medical school, I didn’t think I would be involved in a patient’s care so early in my career where we would be giving life altering news. 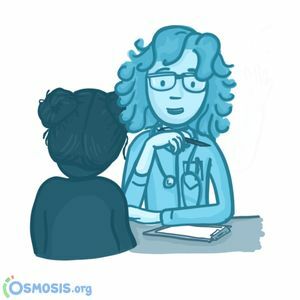 As a student doctor, I was attentive to the manner in which Dr. Andrea approached the topic with Belle, giving her time for it to sink in, and letting Belle know she was there for her and supported whatever her decision was. I know this day will forever be in Belle’s mind. It will also stay in mine. I will remember the melancholy atmosphere in the room, the silent tears welling up in Belle’s eyes, and the reflection she had of her life. As I grow as a physician, these moments with patients will continue to help shape me into the great doctor Belle told me I will be. Caitlin is a second year MD/PhD student at the University of Nebraska Medical Center. She specifically enjoys immunology and pediatrics. In her spare time, she enjoys finding new restaurants in Omaha to try, planning get togethers with family and friends, and cooking. Caitlin has a special skill of making balloon animals, which she hopes to do in her clinic someday!